Tech Reviewer – iPhone 6: Time for an Upgrade? You are here: Home » Mobiles » Apple » iPhone 6: Time for an Upgrade? Months of speculation and rumours were finally put to rest on the 9 th September at Apple’s 2014 Keynote. At the forefront of the press conference was the long awaited announcement of the iPhone 6 and the confirmation of a larger brother, that Apple unveiled as the iPhone 6 Plus. Rapturous applause greeted the announcement of these phones, so what remains is the degree of success these two will have when they go on sale on the 19 th of September. The question for consumers, is whether the iPhone 6 represent a must-have upgrade or a generation worth skipping. First off, let’s outline the specifications of the two phones in question. The iPhone 6 has a markedly increased screen size at 4.7 inches, compared with last years iPhone 5s that was only 4 inches (the pixels-per-inch has roughly remained the same at 326ppi), this brings the iPhone in line with the other premium smartphones on the market. This years edition is also thinner at just under 7mm and the hard edges of the iPhone 5s have been ditched for smooth, chamfered corners. Slight changes in button placement mean the power switch is now located on the side, which is intuitive considering the iPhone 6 is larger in dimensions.The camera remains largely the same as last years with 8 Mega-pixels but now has phase-detection autofocus built-in which will find and focus on the subject much faster; the same technology found in the Samsung Galaxy S5. Apple has improved the processor in the iPhone 6, implementing a A8 SoC which Apple claims has 25 percent more CPU power and 50 percent more GPU power than the A7 SoC found in the 5s. In terms of storage Apple have decided to do away with the 32 GB version and green-lit a huge 128 GB model. Battery life is a big deal and Apple has yet to divulge into hard numbers, having not mentioned any mAh ratings. However, they have claimed 14 hours of 3G talk time, a 4 hour improvement on the 5s. 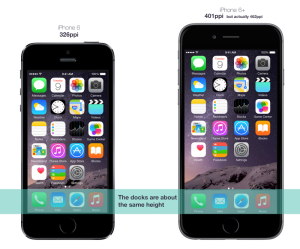 The iPhone 6 and iPhone 6 Plus are largely the same except for the obvious physical differences. The iPhone 6 Plus sports a massive 5.5 inch display at 401 ppi. Thus, it’s primed to join the phablet craze which is surging in popularity in Asian markets like South Korea and Hong Kong. A larger battery is fitted in the iPhone 6 Plus for a reported 24 hours 3G talk time. Another impressive feature of the 6 Plus is the optical image stabilisation, which counteracts hand shakiness more effectively than the digital image stabilisation included in the iPhone 6. 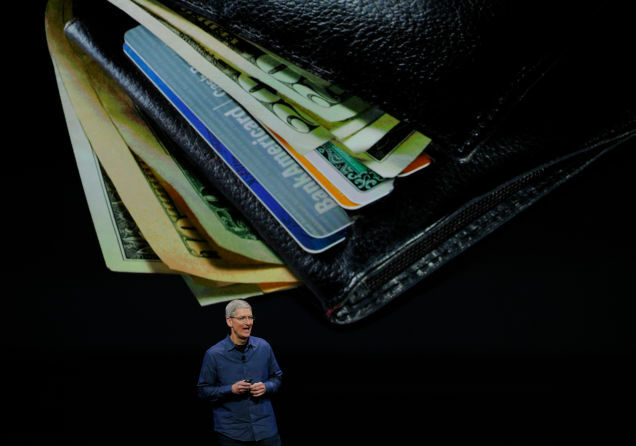 CEO Tim Cook and Apple Pay want to replace your wallet. Of course Apple love to flaunt their devices for the newest and revolutionary features rather than one-upmanship of being the biggest or most powerful phone available. In this years event there was a great deal made about fitness app, HealthKit, on the Apple Watch, as well as Apple Pay on both the Watch and the iPhones. Apple Pay uses a NFC chip in the new range of devices to complete transactions, thus replacing the need for physical credit cards. NFC has been implemented in mobile devices for a few years now, but has yet to fulfil its promise of outstripping the credit card; a prime example is Google Wallet. American Express, Mastercard and Visa have already signed up as partners to the system and with Apple’s simple and clever marketing no-how Apple Pay could just be the spark for NFC payments to become the norm. iOS 8 hasn’t brought about the same radical changes that iOS 7 did, apart from HealthKit and Apple Pay there isn’t a great deal for Apple loyalists to brag about. Increased interactivity with OS X, third party keyboard support and interactive notifications are all nice additions, but they are not the features that make the iPhone 6 and 6 Plus the must-have smartphone. For all the hype and anticipation surrounding the iPhone 6, it personally fell rather flat. By that I’m not insinuating that it was a total disaster, new iPhones will surely fly off the shelves, but rather it didn’t provide the revolution that the hype had led me to believe. The latest iPhones, with their bigger displays, will satisfy those 5s users who were taking a sideways glance at a Samsung Galaxy S5 and the rest of the Android competition. Reaction from the Keynote has generally been positive, with many welcoming the new phones with approval and the Apple Watch with fervent anticipation for next year. Perhaps I’m a little miffed with the iPhone 6 and 6 Plus because all the surprises were spoilt by all the speculation in the build up to the event; even the Apple Watch was correctly predicted. In short, the iPhone 6 and 6 Plus are Apple successors, they aren’t industry changers but are a sort of a culmination of the Apple DNA flowing through the smartphone design of the moment.